Before us earthlings even get a chance to experience Google’s Project Tango “smartphone like device”, it’s going to be blasted in to space later this week. The project will eventually spawn a range of phones and tablets, that are being designed to use special infrared depth sensors and motion-tracking cameras, to create 3D models of their surrounding environments. Google has a number of consumer-end possibilities in mind, including helping the visually impaired navigate by themselves. It has the potential to innovate video gaming. And to replace traditional measuring tools, with its ability to scan an object and report back its dimensions. This technology is also apparently right up NASA’s alley, as the space agency will be utilizing Project Tango for their autonomous robots and satellites, known as Smart SPHERES. Because Tango can create 3D maps of its surroundings, it will help NASA’s SPHERES become more precise when carrying out rendezvous and docking manoeuvres at the space station. Eventually NASA want the SPHERES to carry out a whole range of chores and tasks that usually require an astronaut. “By adding on this cell phone that has the ability to visually navigate where it is by its camera alone, we open up the platform to navigate the whole station,” said NASA contractor Zach Moratto. While they can be pre-programmed and have their own sensor technology, Google’s tech is being described as the “eyes and ears” that will make things far more efficient. “As we were scratching our heads thinking about what to do, we realized the answer was in our hands,” concluded Provencher. On Friday July 11, several of the Google devices will be blasted in to space. Ahead of the launch Google and NASA have been carrying extensive testing in Zero Gravity and space-like environments, to ensure all of the systems and technology can withstand the mission. 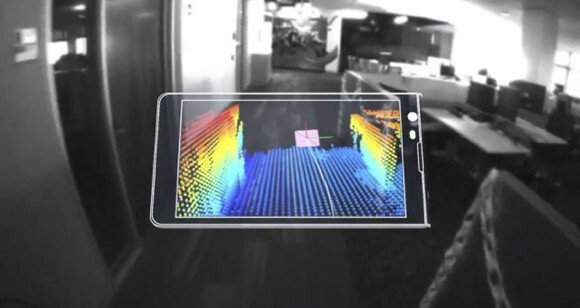 – Project Tango was created by Google’s Advanced Technology and Projects group (ATA). – The Smartphone and Tablet prototypes run on a version of Android and were developed with collaborators from a number of Universities and technology groups from all around the world. – The device’s censors can make over a quarter million 3D measurements every second, updating its position and orientation in real-time.